Honey, Aug. 13, 2014, age "at least 13 years (adopted dully grown in 2002), lymphoma. Not being able to not have a dog, we immediately adopted a 7 year old blind Great Pyrenees after Honey's death. But so sadly, we only had him 3 weeks and 3 days before hemangiosarcoma claimed him on Sept. 23, 2014. His is a story in itself which I will tell later. The Texas Great Pyrenees Rescue said they would refun my money or I could take another Pyrenees. that was a now brainer. We picked Moose. He had found stealing food from a salad bar at a restaurant on the River Walk in San Antonio. Saint Bernard Rescue was notified by they recognized at once he was a Badger marked Great Pyrenees. He was about 3 years old and was adopted by this coupl. They had had him 4 years when they decided to move back home to Minn and open bed and breakfast. Knew thtat was no place for a Great Pyr. Had to turn him back in to the TGPR, but aske to keep him until someone wanted him or it was time for them to move. They had had him 4 years. We met them half way between here and Austin to get Moose and they asked if I would send them an e-mail letting them know he ha made the 100 mile trip okay and was doing okay. I said sure and every couple of weeks I send "newsletters" about his adventures like going to Lowes,Tractor Supply, the beach, to see his friend the horse on the next street, etc. Well, in Feb. I got an e-mail saying she had a favor to ask of me but would understand if I said no. But they were worried their 11 year old golden retriever, Sophie my have a hard time in harsh Minn. winters and were looking for a good home for her and would love for us to take her. We did. They ahad had her 11 yers, since she was 5 weeks old. It was hard for them to give these dogs up, but did what they felt was bestfor the dogs. They hve sent several copies of pictures of the dogs, plus a few gifts like beautiful frame with picture in it, a HUGe stocking for Moose at Christmas with his name on it, etc. I just e-mailed t a "newsletter: last night and sent pictures of Sophie carrying her ear around, playing with a stick in the back yard, etc and a couple of Moose. Please overlook all my typo's. I didn't mention that I have rheumatoid arthritis, hence stiff fingers that off=ten hit 2 kids and the wrong one prints, or I do not hit a key hard enoughand no letter prints. Also, diabetes has totally ruined my vision. I can no longer read with magnifying l=glass as well as my reading glasses, no longer can sew domy cross word and jig saw puzzles, no longer drive. So I do tend tomake many typos. Please over look them. Welcome back to the forum. You have truly done a great deed adopting Sophie and Moose. 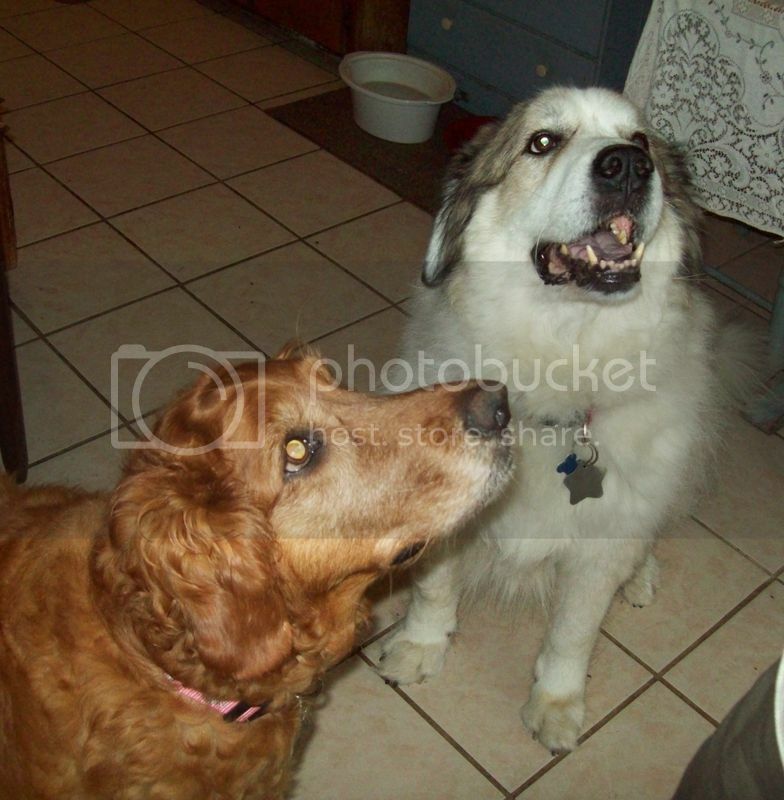 In years past we adopted an old Golden and a Pyrenees. They are truly fantastic dogs. Will be looking forward to further posts from you about Sophie and Moose.